Les Gilliam is proud to have been inducted into the Oklahoma Music Hall of Fame, having been inducted on November 4, 2010. He is the official “Oklahoma Balladeer”, so designated by the Oklahoma State Legislature in 1998. He is a native of Gene Autry, Oklahoma and is a singer, songwriter, and recording artist. He was recently included in a new book “Distinguished Oklahomans”. In 2005, Les received the most prestigious award in Western Music by receiving the coveted “Wrangler Award” from the National Cowboy and Western Heritage Museum in Oklahoma City. In 2006 Les received the Governor’s Arts Award from the Governor of the State of Oklahoma for his many years of entertaining Oklahomans and keeping western music alive. In 2008, he received the “Lifetime Achievement Award” from the Gene Autry, Oklahoma Museum. In 2010, Les received the Academy of Western Artists award for Western Swing Song of the Year for his composition and recording of “Oklahoma 1955”.. He is currently based in Ponca City, Oklahoma and entertains as a solo act with his guitar. 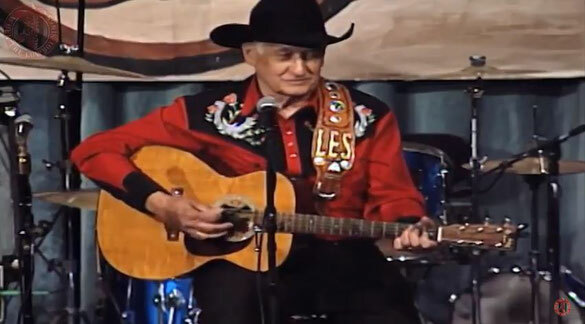 His concerts of cowboy, western swing, country and/or gospel music include fascinating stories about the songs and the artists who performed them. He always includes original songs and humorous material, adding a touch of nostalgia and good ole fashion patriotism. Les grew up in southern Oklahoma where Gene Autry owned a ranch next to their place and Gene would often come to visit them. Meeting Mr. Autry and enjoying his movies and radio show certainly created in Les a love for western music. He was a contributor to the recent book on cowboy music “Singing in the Saddle”, written by his friend Ranger Doug of Riders in the Sky. He was also a contributor to the newly published official biography of Gene Autry, titled “Public Cowboy # 1”. Les has recorded eighteen albums. He is a member of the Oklahoma Arts Council Touring Program as well as the Mid-America Arts Alliance based in Kansas City. Some of his recent noteworthy performances include the Kennedy Center in Washington, D.C.; Silver Dollar City in Branson, Missouri; The International Country Music Festival in Vienna, Austria; The Gene Autry Film and Music Festival in Gene Autry, OK; Rex Allen Days in Wilcox, AZ; Prairieville Farm Days in Michigan; The Bakersfield Opry in California; Western Music Festival in Tucson, AZ; The Cowboy Hall of Fame in Oklahoma City; The Oklahoma Music Hall of Fame in Muskogee, OK; and many others.